PBO, with our partners at the Alaska Volcano Observatory, has begun to install continuous GPS stations on the third volcano in the PBO network: Akutan, a 1300-meter-tall composite stratovolcano located in the Aleutian Islands about 1200 km SW of Anchorage, Alaska. 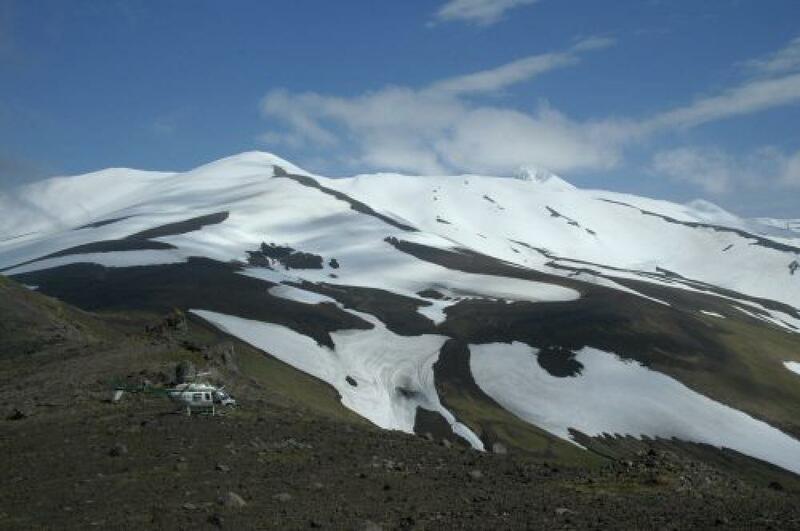 Akutan was chosen as a target for PBO GPS studies because it is one of the most active volcanoes in the Aleutians, with 30 recorded historic eruptions including one in 1992, as well as intense ground deformation related to shallow dike intrusion in 1996. Akutan also has diverse magmatic systems, ranging from basalt through rhyolite, though most of its lavas are andesitic. 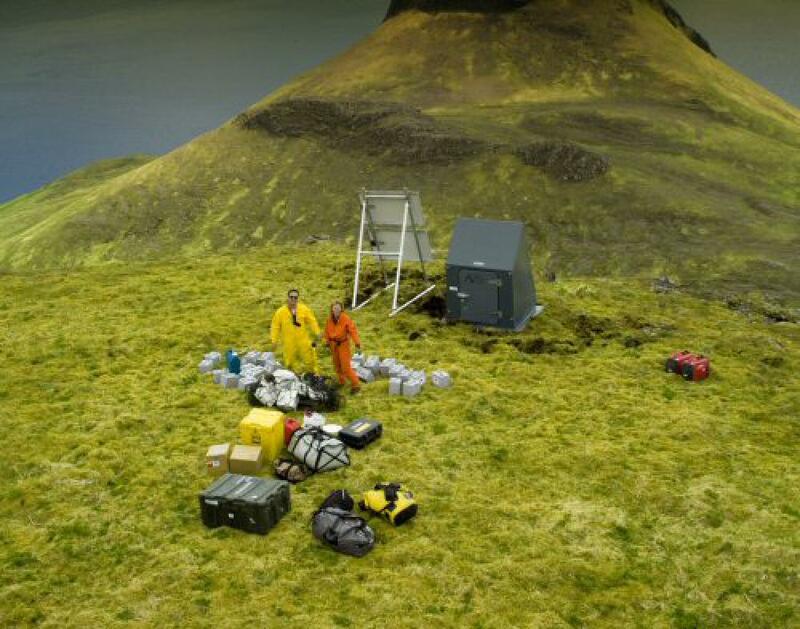 PBO’s GPS studies of Akutan will help us better understand magma movements beneath plate margin volcanoes in a subduction zone, the dynamics of eruptive and intrusive processes, and help scientists improve eruption prediction and volcano hazards mitigation. 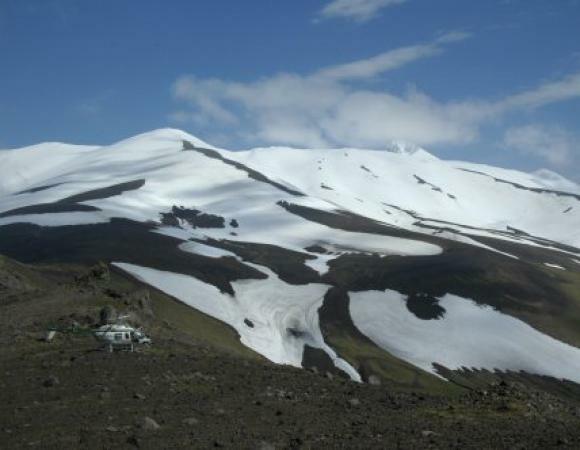 PBO plans to install eight continuous GPS stations on Akutan during the next few weeks. As with everything in the Aleutians, getting to Akutan is a bit of a challenge. Team members first arrived in Anchorage from California and Colorado (or elsewhere in Alaska), and then flew to Dutch Harbor, about 1300 km SW of Anchorage. After overnighting in Dutch Harbor, crews then flew to Akutan, a 20-minute flight back to the northeast on a Grumman Goose floatplane. 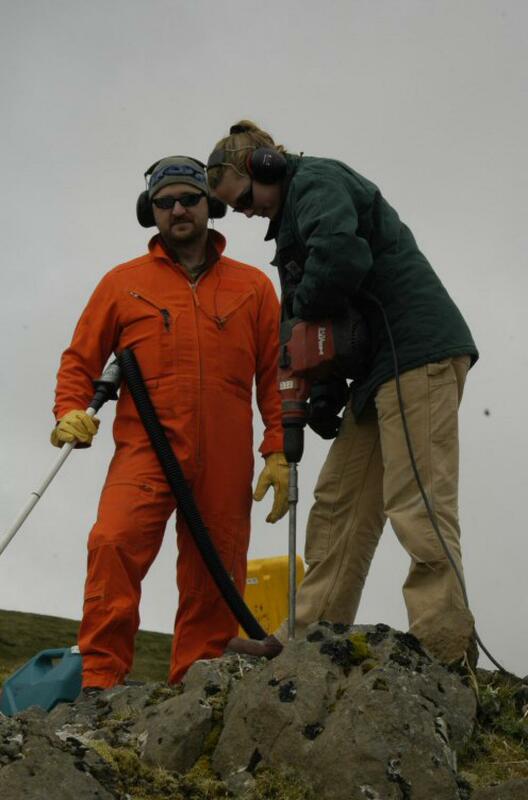 Upon arrival on Akutan on Friday, June 17, the field crew began sorting equipment and configuring the huts that will be used to store the receiver, batteries, and other ancillary equipment. 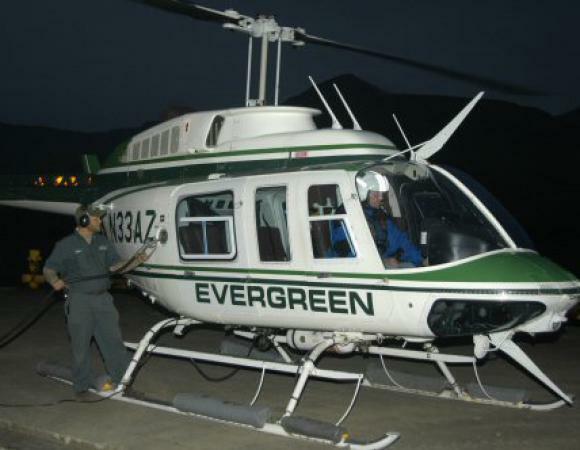 The next day, they continued to assemble equipment, including the “swing sets” that are used to hold the solar panels to power the stations, and welcomed the arrival of a pilot, mechanic, and helicopter from Evergreen. 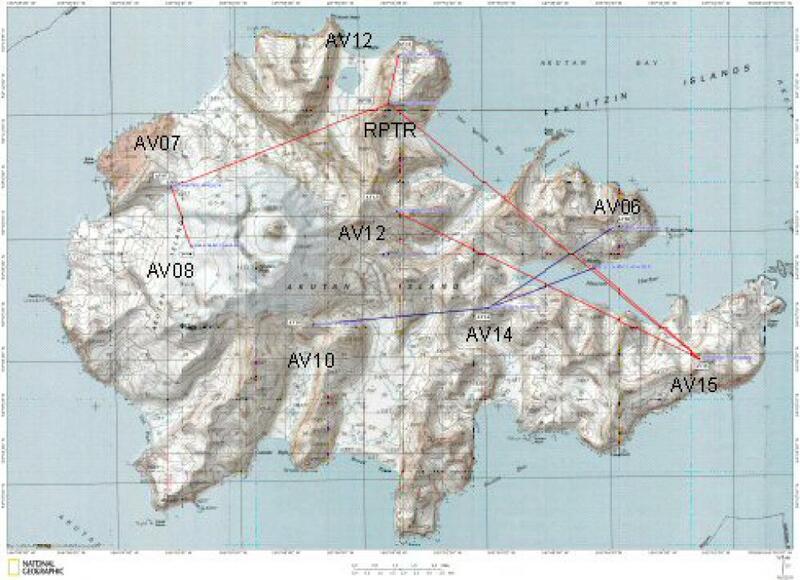 June 19 began with good weather, and Mike Jackson, Andre Basset, and Tanja Petersen flew to the location of AV15 (see the Akutan network map at right) to mark the site. 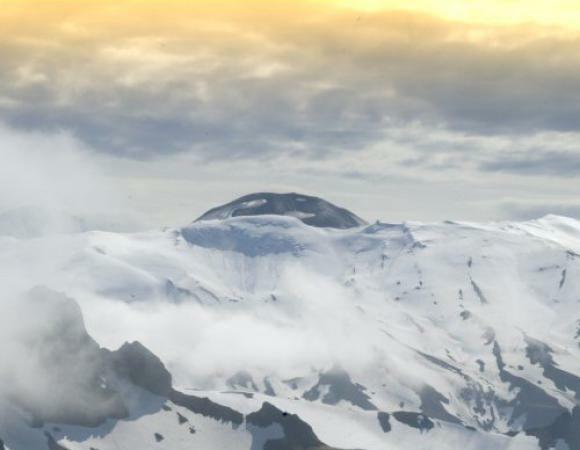 While they were there, the Aleutian weather gods decided three days of good weather would be too much, and clouds moved in, requiring the crew to descend to a lower altitude for pickup by the helicopter. Mike, Andre, and Tanja shifted operations to AV06 to mark the site and prepare to receive tools and equipment brought to the station in a sling suspended below the helicopter. After receiving four loads of equipment, Andre and Tanja remained to work on the station, completing about 50% of the installation before overnighting at the station. 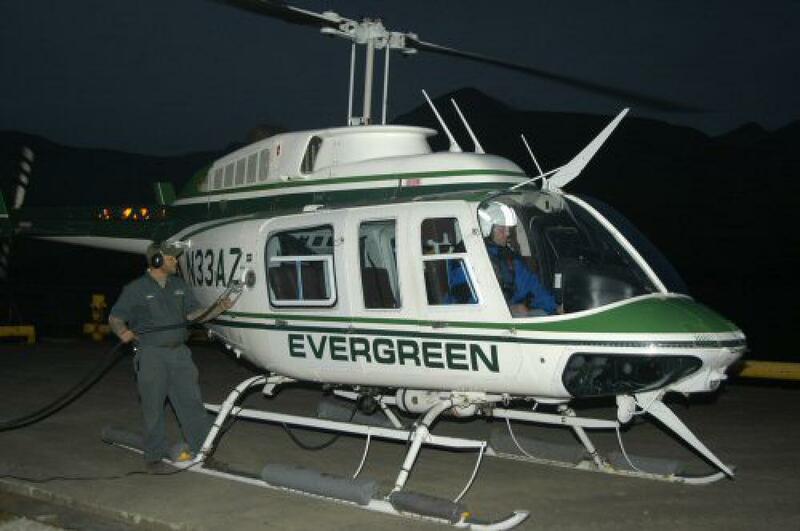 Meanwhile, Mike Jackson returned to base camp with the pilot to pick up Dave Mencin. 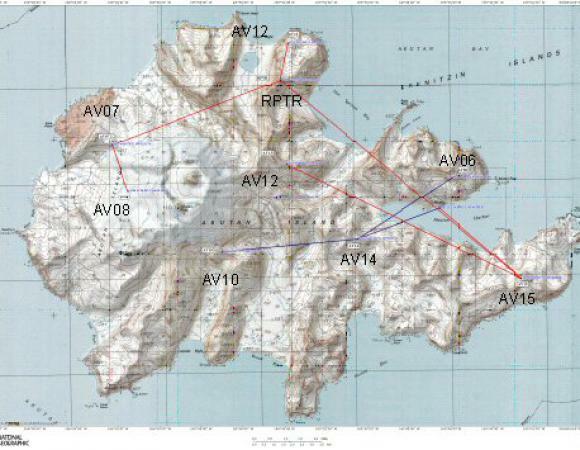 Mike and Dave then flew to AV12, AV07, and AV08 to mark those stations. Monday, June 20 brought bad weather, with rain, high wind, and low clouds preventing any helicopter operations. Instead, crews took advantage of the time to continue configuring huts and building swing sets for later deployment. Andre and Tanja completed about 80% of the installation of AV06 and then left the station to walk back to base camp. There, they met the rest of the crew and joined in hut and swing set assembly. 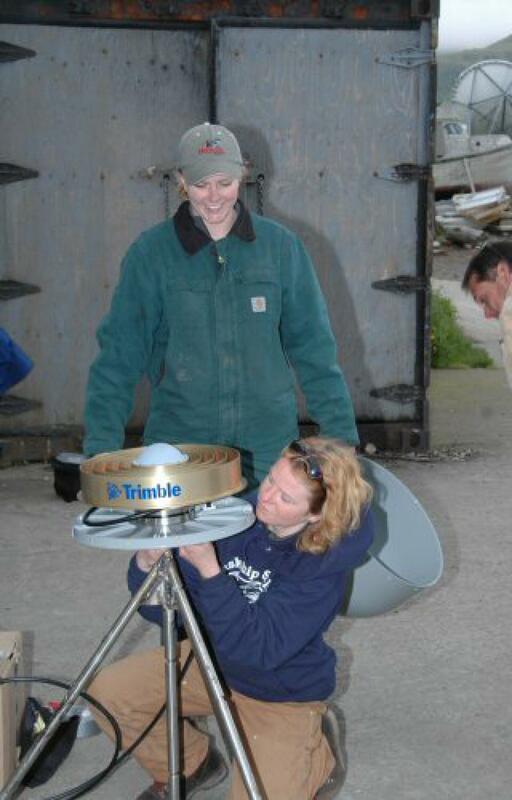 Tuesday, June 21 dawned with good enough weather to fly Andre and Tanja back to AV06 to complete the installation of that station, and Mike Jackson, Dave Mencin, and Kelly Kore to AV14 to begin installation of that monument. At the end of the day, AV06 was recording data, and the AV14 monument had been installed and ready for the rest of the equipment. June 22nd, 23rd, and 24th came with high winds, rain, and low clouds that prevented flight operations. 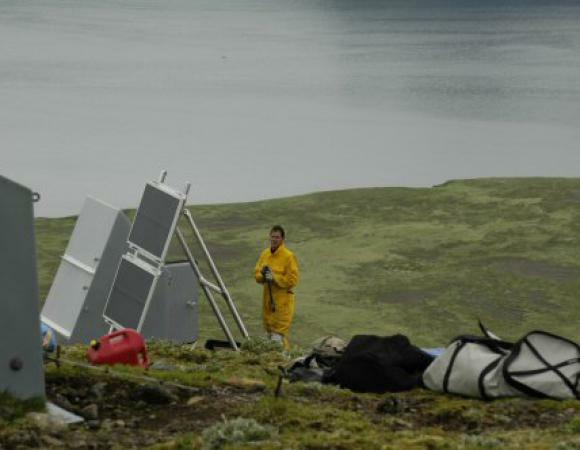 Crews instead concentrated on configuring huts, building swing sets, and on programming radio communications systems to transfer data from the Akutan stations to the PBO data center in Boulder. 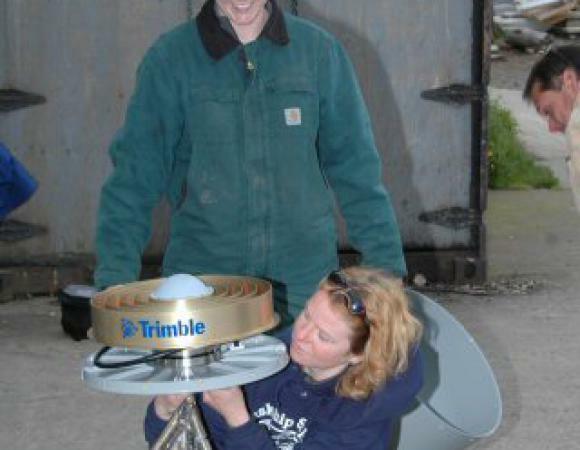 Also, new crew members received training in monument installation, welding, antenna mount leveling, and antenna/dome installation. All this hard work will make later station installations easier. 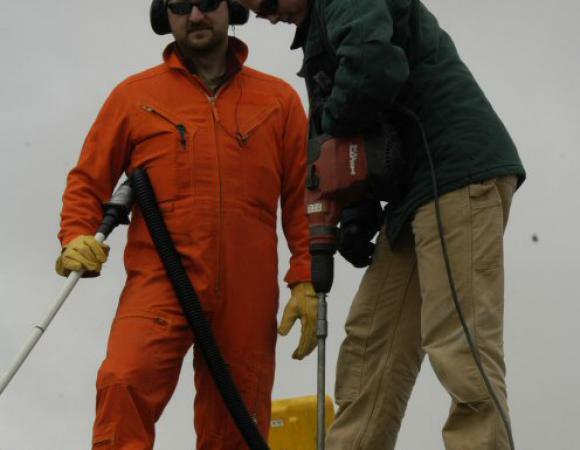 On Saturday, June 25, the weather broke and crews were able to exercise the helicopter properly. 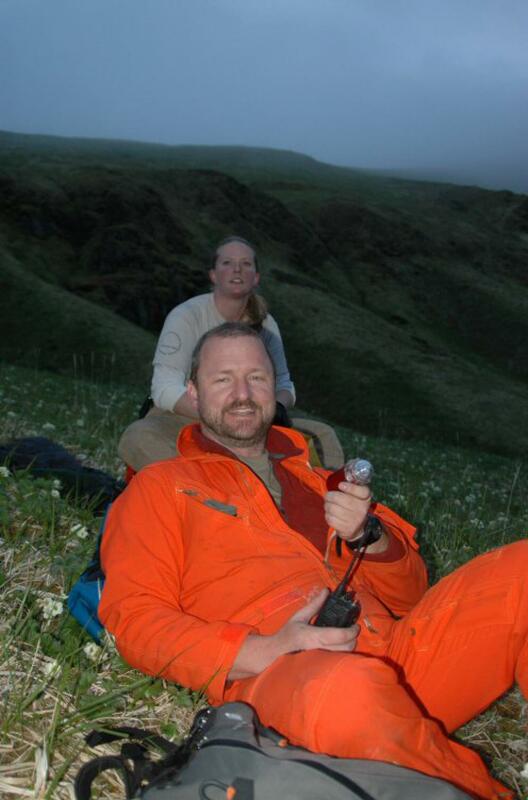 Andre Basset, Tanja Petersen, and Zak Hargraves flew to AV06 to finish the station and get data communications working to base camp. Meanwhile, Kelly Kore and Warren Gallaher flew with their equipment to AV14, planning to overnight and finish that station. 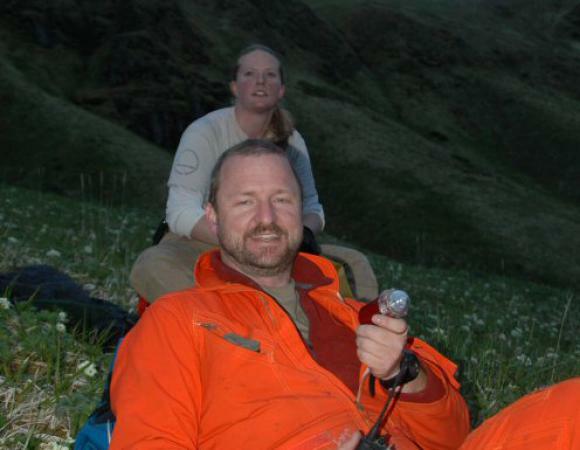 Andre, Tanja, and Zak then flew to AV15 to begin installation of that station; they would also be treated to an overnight camping trip in the great outdoors of Akutan. Sunday, June 26 brought more good weather and lots of activity across the island. Andre, Tanja, and Zak continued to work on AV15, while at the same time, Mike Jackson and Dave Mencin traveled to AV07 to receive equipment brought in the helicopter’s sling. Kelly and Warren brought AV14, fully online by 7 PM local time, and headed back to camp. 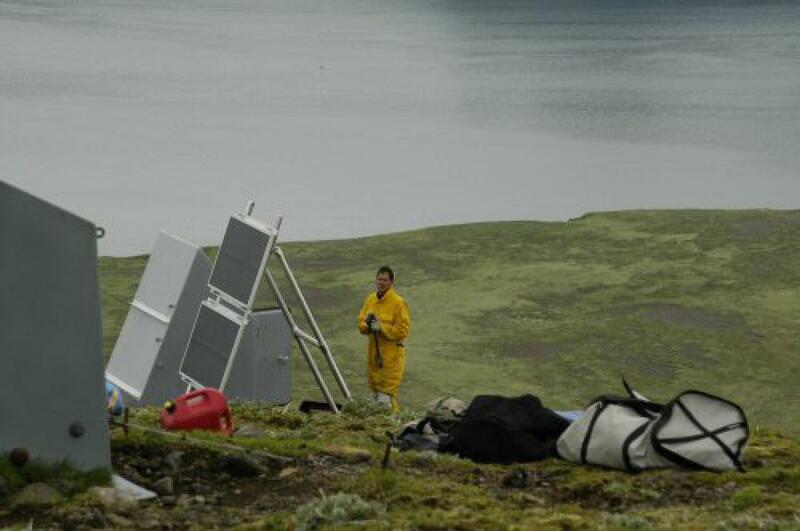 PBO ended the day with two complete stations installed on Akutan and one more in progress.